Last month, international colour authority, Pantone, announced its highly anticipated Colour of the Year 2018 as Ultra Violet. Described as dramatically provocative and thoughtful by the Pantone Colour Institute, Ultra Violet yields the power to look to the future and ‘lights the way to what is yet to come’. Seen as a bold colour choice by many, Pantone believes Ultra Violet symbolises unconventionality and artistic brilliance. 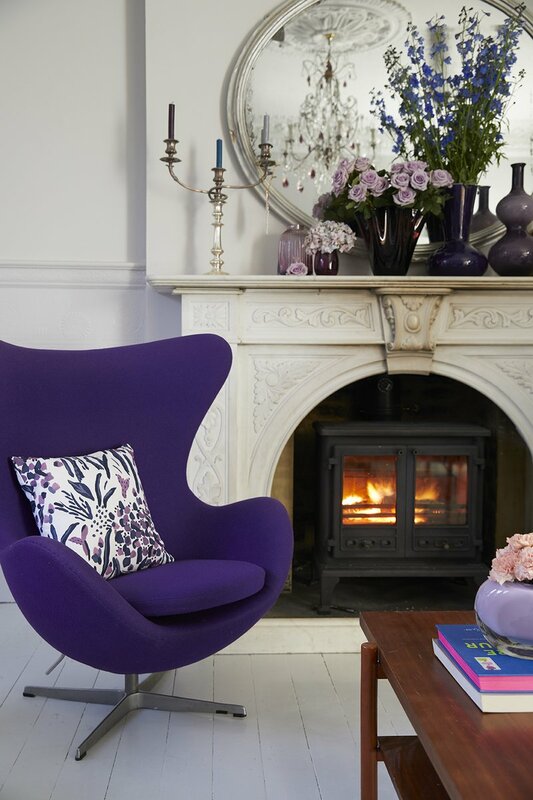 So, what better colour to inject individuality and life into your interior than this inspirational shade of purple? 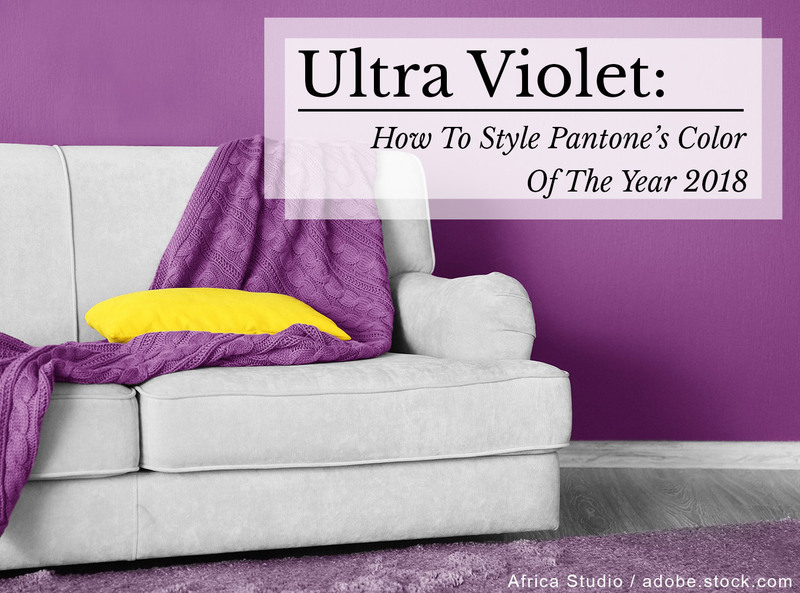 Looking forward to the year of Ultra Violet, The LuxPad has spoken to a selection of interior designers and influencers to find out their opinions of Pantone’s latest Colour of the Year and get some tips on the best way to style Ultra Violet in the home. Ultra Violet is such a rich colour; it makes me think of inky night skies, sumptuous party frocks and bold flowers. It’s definitely a strong colour, and as such will work fabulously as an accent; use it on cushions, throws, ceramics, wall art and tableware. Or combine it with the popular trend of bringing the outdoors inside and add some purple flowers to your room scheme; iris, sweet peas and alliums would all work brilliantly. Ultra Violet, Pantone’s colour of the year for 2018, is not for the faint-hearted. Upon announcement, I must say my head wandered off to the shirts of Laurence Llewelyn Bowen in the infamous Interior show Changing Rooms! And whilst I personally wouldn’t be keen on using it in a whole space. 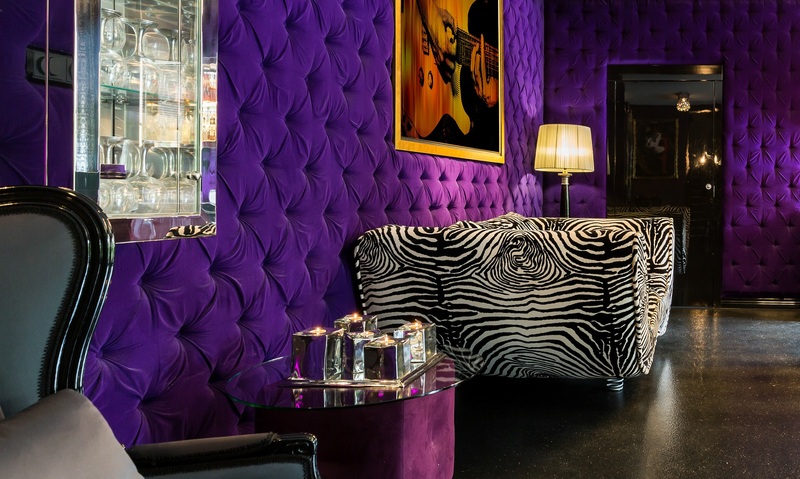 Ultra Violet is the perfect colour for adding a bit of rock and roll to an interior. Think plush velvets married with dark interiors and pops of gold metalware. It’s a great colour for layering in various textiles whether knitted or pile fabrics or those with sheen such as raw silk. It’s also the perfect shade to update dark walls in shades such as Farrow & Balls Down Pipe or Railings. According to Pantone, ‘Ultra Violet communicates originality, ingenuity and visionary thinking.’ It is a bold colour for the brave, for those willing to be different, for those who can take a risk and stand by it. Use it well and rest assured, you’ll achieve stunning results and that one in a million look. Use Ultra Violet with lots of white to allow it to make its own strong statement, rather than undermine its energy by adding other colours. Add different materials and textures to build interest and strengthen its individuality. This year’s choice of Ultra Violet is meant to elevate awareness, unlock potential and stimulate creative expression. These qualities make the blue-ish purple an excellent addition to a well-loved space. Choosing to go bold and give a whole room an ultra-makeover? Be sure to break up those tones with a punch of another colour. If you aren’t looking to take the purple plunge, an easy way to introduce the colour can be found somewhere unexpected – your potted plants. Spanish moss readily takes on the colour of store bought fabric dyes – make a statement with your succulents! Pantone’s colour of the year for 2018, Ultra Violet, is certainly not one for the shrinking violets out there! However, don’t be put off if bold and vibrant shades aren’t usually your bag. 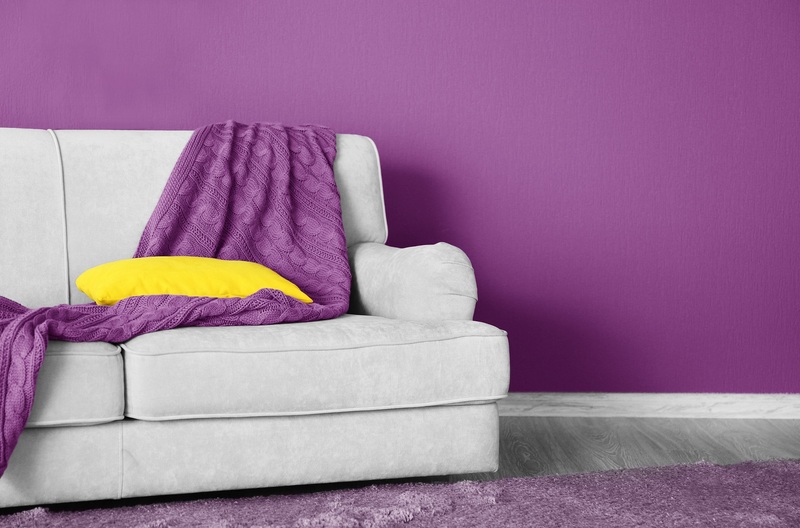 Home accessories and soft furnishings are the perfect way to introduce Ultra Violet into your home and can be easily (and more cheaply) changed when the next trend comes along. We particularly like this Gypsy Cowhide Rug by Mineheart! Pantone’s Colour of the Year 2018 is the blue-based purple, Ultra Violet. Purple in colour psychology is the colour of spirituality and creative expression and is associated with mindfulness. This powerful shade, when used in interiors, can bring inspiration and create a spiritual connection. It can be used either as an accent in soft furnishings or for a more powerful and intense effect on walls and furniture. Ultra Violet can be paired with other jewel tones or used as an eye-catching accent to a paler scheme. Either way, Ultra Violet will bring a sense of drama to any interior. I’ll admit, when I heard that Pantone had selected Ultra Violet as their colour of the year, I was a tad surprised. Sure, lilac or lavender, maybe even amethyst or plum, but Ultra Violet? 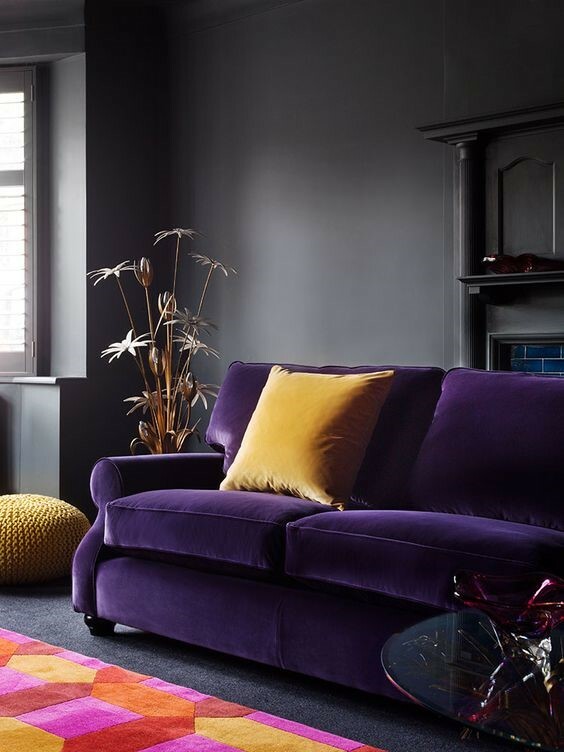 This intense and dramatic purple colour is not for the timid or those who play things safe, but it can be incorporated into your decor without resembling the likes of Prince’s Paisley Park Estate. 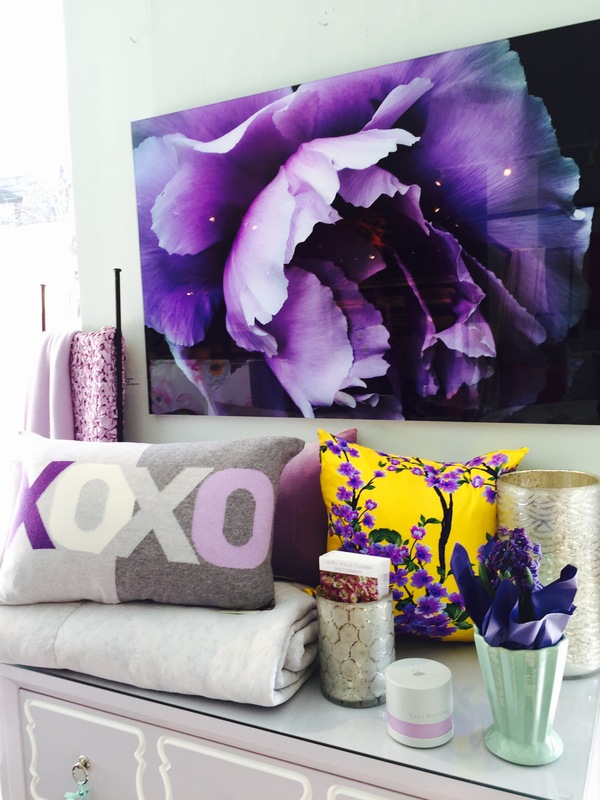 Ultra Violet is best when used as an accent, in small doses, against a neutral palette backdrop. Mixing in lighter shades of purple, helps to soften the intensity of Ultra Violet, providing a layered approach to colour, while still keeping a calm palette. The rich, regal, and sophisticated space in the image above, exudes confidence, passion and drama, incorporating Ultra Violet perfectly, and making a unique statement. 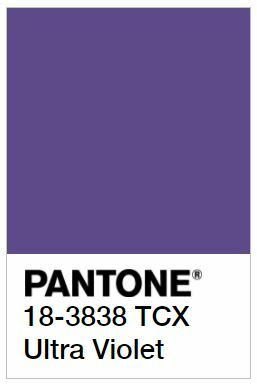 I am thrilled that the colour chosen by Pantone is Ultra Violet for 2018! I have always used rich deep purple shades throughout my interiors as a wonderful, unexpected surprise. For example, a dining room drenched with golds and ivory patterned fabrics and wallcovering that still needed a ‘wow factor’. 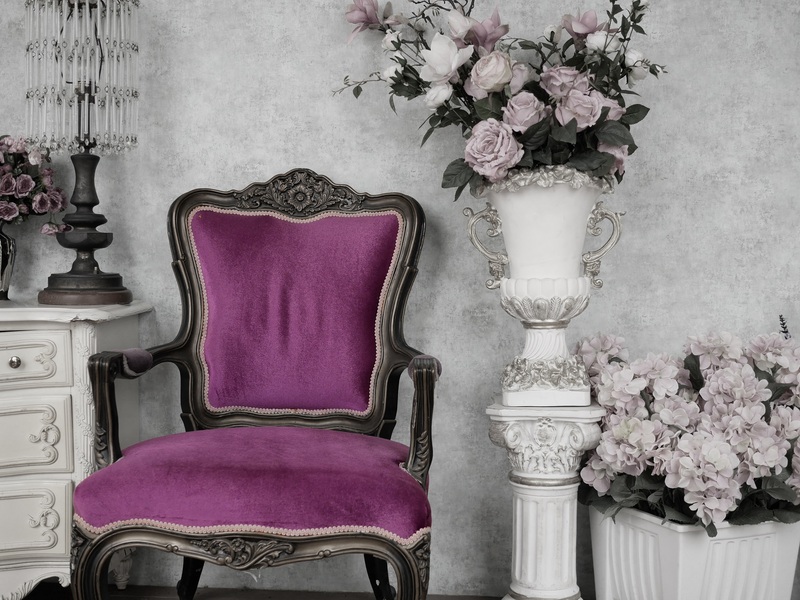 To bring the room a rich elegant blast of ‘wow’, I covered the dining chairs in the royal purple shade. Purples give a sense of confidence, a creative individuality to a room. Gift your powder room amethyst faucets, use purple shades of glass tile in your master bath or purple mohair velvet accent cushions in your living room. It is a colour that complements every other colour of the rainbow. So, go ahead and strike a note of interest and dramatic brilliance in a room to toast 2018. In 2018 we will continue to embrace colour in our interiors and Pantone’s Ultra Violet purple is finally having its day in the spotlight. Unless we are reflecting on 16th French royalty, for decades, purple has been reallocated to kids’ rooms or simply not included at all. The most natural way to incorporate the colour into your space is by either including as a pop colour or adopting it as inspiration for a full-colour palette. Pull in purple by recovering a vintage piece of furniture as an accent or use as wall colour combined with a moulding painted in a deep navy, which will keep it as a background colour. Purple is not for the faint of heart. Be brave. Much like last year’s Greenery, with Ultra Violet I think we can flex some creative freedom when it comes to which shade of purple to use in our interiors. 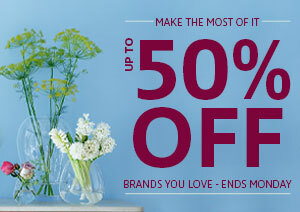 From deep berry shades to paler lilacs, they work beautifully as an accent colour. 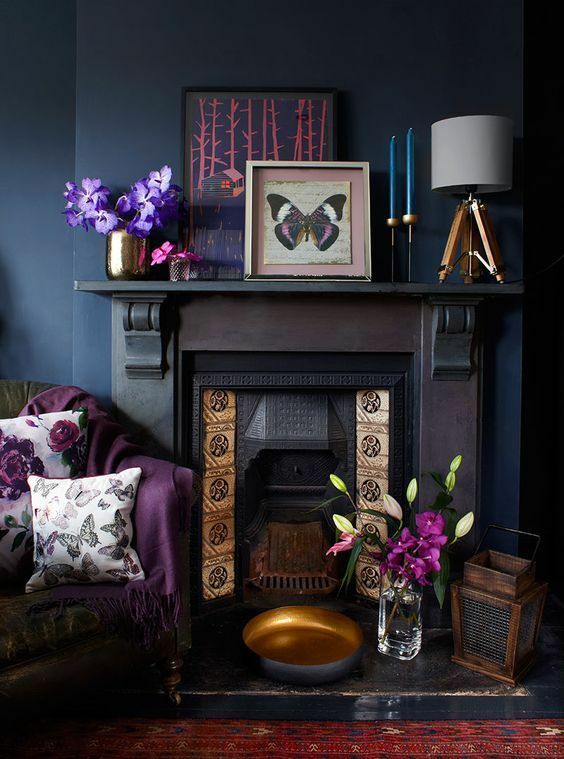 I love to see rich purple next to darker greys – a combination I have in my own home – and the surprising colour combination of purple and millennial pink looks both fresh and luxe at once. Dip your toe in the water with flowers, artwork and cushions or if you are more adventurous a velvet accent chair will work well with a number of different looks. When it comes to interior styling, Ultra Violet is best suited for use as an accent colour rather than your room’s main hue. The purple inner disc and struts on the Louis Poulsen PH5 pendant lamp provide a perfectly subtle Ultra Violet accent while the timeless nature of this versatile design classic means that it’ll live long after this year’s Pantone Colour of the Year has been replaced. For more of a statement piece, look towards the Harry Bertoia Diamond Chair from Knoll, pictured above. 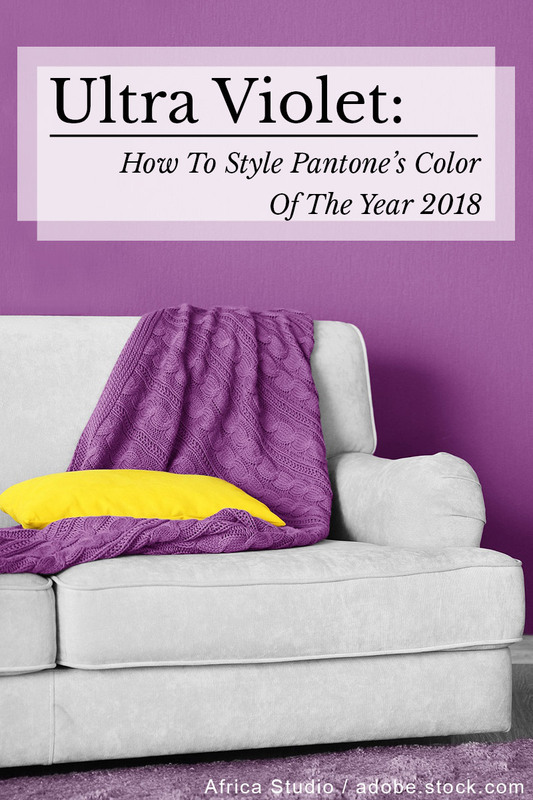 From subtle touches of purple to bold rooms overflowing with Ultra Violet, you’re sure to find plenty of ways to incorporate Pantone’s Colour of the Year 2018 into any room in your home.